*Well this is another hot mess Chris Brown’s got himself in. It kinda seems like he’s into relationship drama. If so, that’s what he’s got on his hands. Chris’ most recent ex-girlfriend. Miss Karrueche Tran, wants him to shut his trap. She is pissed Brown made that highly-produced drunken video confession about loving her and Rihanna. Sources close to Karrueche Tran tell TMZ … she’s livid over the fact that Brown blasted their personal problems all over the internet with his ridiculous video — in which he confesses to loving Rihanna and Karrueche at the same time. 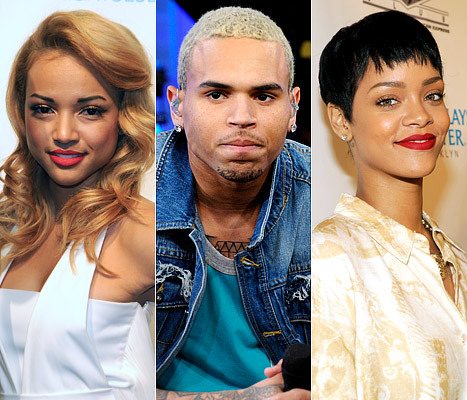 If Chris thought the video would soften the blow of breaking up with Karrueche … he was dead wrong. We’re told KT feels Brown should have kept his feelings private and she’s disappointed and hurt by his decision to broadcast their personal life. Dude is playing with fire. And you know what happens when you play with fire. Girrrrrrrr, once you calm down, you’ll realize that you dodged a fist!!!!!! Now go find yourself a man next time. I believe all of this foolishness is staged. I can care less about any of these idiots. She’s smart to move on…saves a stompin….